I found this Pirate Captain Bag Charm today and it looks quite interesting! It is a Duplo and it seems that the product line is already stopped, I don't think this will be used, as it will be kept as Souvenir. Lego does offer a lot more than sets and bricks, and it is fun to see many interesting items today at ani-com. Did you once come across this? Or do you own one? There were recently some heated discussions in Hong Kong regarding the preservation of a traditional Chinese art - Yue Opera (粵劇) , Yue (粵) is the shorthand name for Guangdong, a southern province in China where Hong Kong originally belongs to (and Guangdong dialect is the local tongue here), the dialect, culture and life style of Guangdong is quite different from the northern part of China, such as those from Beijing, where they have the Beijing Opera (京劇). These opera usually depicts the stories of famous personalities in ancient history, and Yue Opera used to have a large number of fans here a few decades ago, but not any more. I am not a fan of Yue Opera, in fact, I would switch TV channel when I saw it on TV (when I was a kid), but I strongly agree that such cultural art should be preserved, and this creation from Vincent Cheung (fvin) is truly astonishing! I am not surprised at all to see it featured in brothers-brick! The work represents a character (with face mask made-up) and the decoration usually involved in a Chinese Opera show, the character is General Kwan (關羽), a famous personality from the Three Kingdom era (around A.D. 200), who is also a symbol of Loyalty and brotherhood in Chinese history, please note his famous weapon, which has a special crescent moon shape. General Kwan is popularly idolized as Master Kwan and served in many homes here in China, I believe that many police departments in Hong Kong also do that. This creation is one of the 20 finalists in the Lego Hong Kong MOC Competition, I believe that it should be in top 3, and is a true champion material, but I think the meaning of this work is more than Lego skills, I deeply appreciate that Vincent choose this topic, which is both challenging, and helpful for the young generation to understand a shining page of Chinese art. 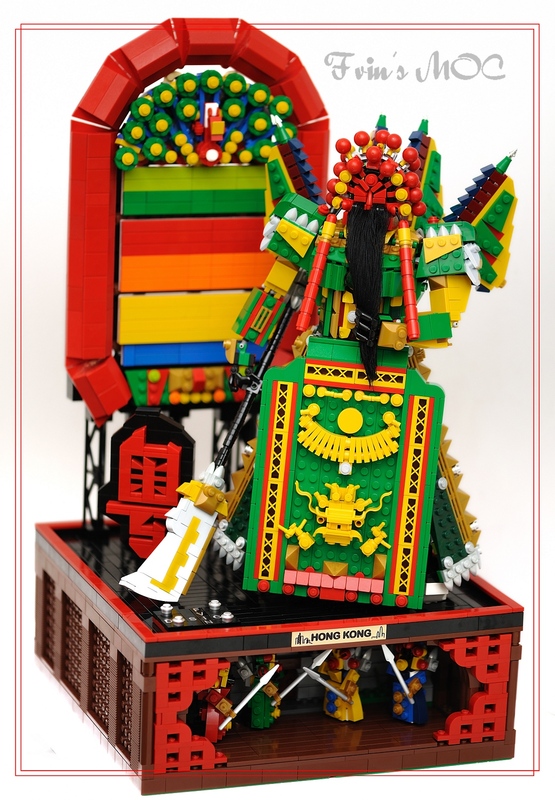 And I think this creation also proves again the feasibility of a Lego Chinese Theme, looking forward to see more exciting work like this from fellow Lego players in Hong Kong. While a review for a minifig pack like this can be boring, I tried to add some flavors to it to make it more interesting, I hope this works. Q. Can the tiles on the Tic Tac Toe plate be removed? Q. Are they regular minifigs? Q. Is it fun to play with? How about playing a game first? Things are getting out of hand! Actually all these can be avoided, the conclusion: DO NOT play Tic Tac Toe. So how can we use this thing? At today's Ani-Com, the Lego booth has two great display sections, one is the Starwars creations section, the other is the display area for the 20 finalists of the Local MOC Competitions! I wish I can take pictures with much better quality, but the venue was quite small and I did not want to block the passage, I believe that the owners themselves should have better photos of their own work, and you may easily come across them somewhere somehow. There are a few creations that I especially appreciate, and some of them exhibits the oriental cultures and are the kind of work that most people in Europe and US rarely sees, I'll try to elaborate on a few of them in the next few days. Although it does not sound like the perfect venue for Lego to host a booth, but the biggest annual event of Lego Hong Kong here in this city is at the Ani-Com! (http://www.ani-com.hk/front.htm). Ironically, despite their intention to make Lego fans happy (and having big sales at the same time), they got criticized every year. It was a long and difficult day of Lego purchase, I am not crazy enough to queue up 5 days before the event starts (someone did here, but not for buying Lego I think), I arrived 15 minutes before the event started, and arrived at the Lego booth 45 minutes later, this was already fast compared to last year, thanks to the rennovation at the Convention Center which makes the flow smoother. But at the Lego booth, the queuing time was still the same as last year, it was another over 45 minutes wait. I did not make much purchase (I got only a Pirate Battle Pack and Pirate Tic Tac Toe), my main purpose was to buy parts, and it took them 4 hours before I can pick them up, their estimation was 2.5 hours - and for that, I almost skipped lunch. Not to blame the local Lego Staffs, I think they are good tempered and works hard, but it was really too difficult for them to manage. Lego Hong Kong have improved this year, but obviously still not enough. I once worked for the Hong Kong Subsidiary of a US Company (much bigger than Lego) and took care of the product evangelism of certain product/customer segment, it was always not easy to please everyone, but measurements are measurements, not only that you have to please a lot of people, you are not supposed to make one customer mad, so how to manage customer expectations would be key, I think Lego Hong Kong suffers because they did not handle this aspect well, plus the ineffective flow and insufficient backend support, no wonder there are angry voices. But don't get me wrong, I was not unhappy at all, as I have been in their places and understand what's going on, I just calmly accept that, and after all, I got the parts I need, and Lego Hong Kong did a great job by getting these parts to Hong Kong, so even if I have to wait for hours, I got them at a reasonable price without paying high shipment costs to overseas sellers. What makes me sad is that my favorite hobby product provider was not able to be the best in making the fans happy, while there sure can be ways to do so. A small brick-wall (samples), not comparable at all to what I saw in US Lego Store, but better than none.